The background and history of Ronald D. Davis, author of The Gift of Dyslexia and The Gift of Learning. The talents and frustrations associated with dyslexia. A visual tour of what occurs during a Davis Program. How creativity and clay modeling enable dyslexics to master letters, symbols, words, and mathematical concepts. Interviews with Davis Facilitators about their clients’ successes. 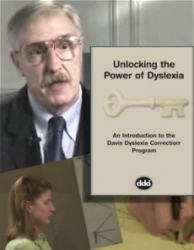 The International scope of Davis Dyslexia Correction.